On the Olympic Peninsula, the lush ferns and mosses will make you forget the real world. Tour includes a visit to a Pacific Ocean beach with sea stacks and sand, a walk through easy trails in the Hoh Rain Forest, and a 30-minute trail to a waterfall. Of all the mountains that surround Seattle, Mt Rainier stands the boldest. Appreciate the beauty of Mt Rainier on this full-day tour from Seattle. On clear days, you can see the mountain from downtown, but to grasp its full grandeur and magnificence, you must see it up close! 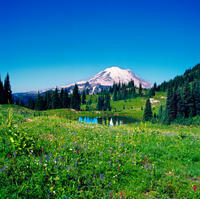 Visit Mount Rainier National Park on this private, full-day tour. See waterfalls, old-growth forests, flowering meadows, and plenty of wildlife in their natural habitat. 'This'new experience on Mount Rainier makes the expected stops ' with fantastic views and vistas, waterfalls, and park grounds, but also ventures off the beaten path. This private tour travels all the way around Mount Rainier, and the different landscapes are fantastic. Lunch and three stops for trail walks and/or waterfalls are included. On the Snoqualmie Falls and Seattle winery tour you will see incredible views and taste wines at Chateau Ste. Michelle and another boutique winery. This sightseeing excursion will lead you deep into the rolling Cascade foothills, past lush horse ranches and flower farms to popular Hollywood locations for such famous productions as Twin Peaks, Northern Exposure and The Vanishing. Scenic single lane rural roads lead you up to the peaceful shadow of Mount Si through the Snoqualmie River Valley to the edge of the breathtaking 270 foot Snoqualmie Falls. Mount St Helens Volcano is a must-see attraction, and this small-group tour from Seattle is the ideal way to visit the national monument. A professional naturalist guide will take you to Mount St Helens National Volcanic Monument in a luxury Mercedes van. Visit the observatory, go on an educational trail walk, and learn about the Volcano's infamous 1980 eruption. During the tour, enjoy a gourmet picnic lunch accompanied with local Washington wines, in addition to light snacks and beverages throughout the day. On this memorable day trip through the Cascade Mountains, you will see beautiful mountain landscapes, gold-mining towns, at least 3 waterfalls, and travel along white-water rivers. This is a mountain loop tour, starting first over Stevens Pass where you will see Bridal Veil Falls and where Big Foot has been spotted! You'll also see Deception Falls, then follow the Little Wenatchee River through Tumwater Canyon to Leavenworth.You will have a couple of hours in Leavenworth for lunch, then continue over Blewett Pass, an old gold mining town, and Snoqualmie Pass, where we will stop at Snoqualmie Falls. Leavenworth is a featured tour itself, a Bavarian Alpine Village with character of its own. Traveling north into Washington from your location in Portland, a professional naturalist guide will take you to Mount St Helens National Volcanic Monument in a luxury Mercedes van. You'll visit locations surrounding the blast zone from the 1980 explosion before arriving at Mount St. Helens. As you drive along Spirit Lake Highway, you'll stop by Ape Cave, and may take a peaceful walk along the Hummocks Trail or pause to reflect alongside the blue waters of Coldwater Lake. After enjoying a picnic lunch, you'll arrive at the Johnston Ridge Observatory to embark on an interpretive walk along the Eruption Trail. The trail offers sweeping views into the crater, and teems with purple lupine and other wildflowers in the mid-to-late summer. Admire close-up views of Mt Rainier's snow capped peak, one of Seattle's most iconic sights, on this full-day nature tour. See glaciers, waterfalls and wildlife in Mt Rainier National Park with a naturalist guide, and get a vivid sense of the mountain's beauty while walking or snowshoeing, depending on the season. This small-group day trip limited to 10 people includes French-pressed coffee, pastries, light snacks, a picnic-style lunch with wine and downtown Seattle hotel transport by luxury vehicle. Myth and magic come to life at Tillicum Village, located 8 miles from Seattle's waterfront on Blake Island State Park. Here, you have the opportunity to learn about the Native American culture and watch a 25-minute show featuring traditional song and dance. A delicious fish'buffet is included on this enriching and enthralling excursion for the entire family. On this full-day tour of Washington state's Mt Rainier, you'll visit the majestic 14,411-foot (4,392-m) volcano and learn about the area from your informative guide. You'll also explore local treasures like lakes and waterfalls en route from Seattle to Mt Rainier. Nature lovers won't want to miss this!